Retro-Forteana: The first Paranormal Investigator? I mentioned Joseph Glanvill’s book Saducismus Triumphatus in my post about The Daemon of Tedworth a year ago. Since then, I’ve managed to find an online copy of the whole book, and it’s really very interesting. The Fortean world centres around the conflict between “skeptics” and “believers”, with Forteans sitting on the sidelines looking on in amusement. Glanvill’s book may be the first work ever written that specifically addresses this conflict. In an earlier post I wrote about David Hume: a skeptic in the 18th century, and another one described William Hogarth’s satire on Paranormal investigation, 18th century style. 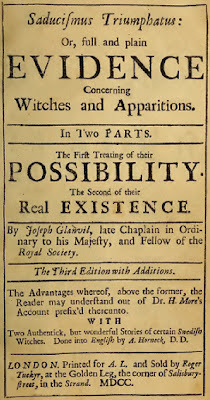 But Glanvill lived in the 17th century -- Saducismus Triumphatus was published in 1681, the year after his death. The title is Latin for “Triumph over the Sadducees” -- “Sadducees” being Glanvill’s word for scientific skeptics and rationalists. 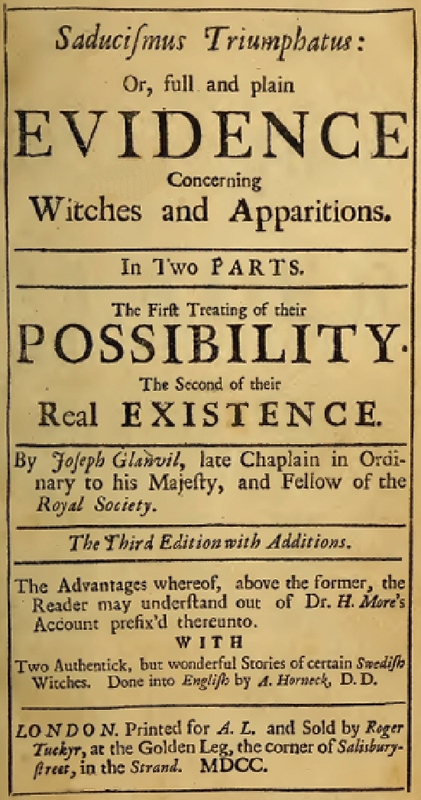 Glanvill himself was an avid believer in the supernatural, largely because he considered that there was ample scriptural authority for its existence (in his day job, he was a clergyman). One example will give the idea. Glanville’s tenth “Relation” concerns “The Apparition of the Ghost of Major George Sydenham to Captain William Dyke, taken out of a Letter of Mr. James Douch to Mr. Joseph Glanvill”. The witness in this case was an Army Officer, Captain Dyke, and therefore his testimony was automatically accepted as correct in every respect. The Captain had been friends with another officer, Major Sydenham, who was a devoutly religious man. Dyke on the other hand was a worldly cynic, and the two of them had many friendly arguments about the nature of God and the Afterlife. They agreed that whichever of them died first would visit the other on the third night after the funeral, and tell them the truth of the matter. In the event, it was the Major who died first, and the Captain duly kept a lookout at the appointed time -- but the Major’s ghost failed to turn up. Then one morning about six weeks later, Captain Dyke was woken up by an unexpected visitor in his bedroom. It was the ghost of Major Sydenham! The ghost told his old friend: “I could not come at the time appointed, but I am now come to tell you that there is a God, and a very just and terrible one, as you will find if you do not turn over a new leaf!” Glanvill takes this as clear evidence of the afterlife and the existence of God -- he isn’t bothered by the fact that the Major’s ghost didn’t turn up when the Captain was keeping a vigil for it, but waited until he was sound asleep. If you ask me though, it sounds like a particularly vivid dream! Andrew, great write up. But the punchline at the end--about dreams--comes off as unnecessarily dismissive. It's a staple of folklore and paranormal belief that dreams can be used as junctions where the two worlds merge. So an intelligence--a "spirit"--not strong enough to manifest in the daylight might have just enough energy to be able to appear to someone when their mind is in that twilight state brought on by drowsiness. In Eastern mysticism, it's when your "third eye" is opened up a bit more. I think our own modern view of the dream-state as "the arena of the subconscious and nothing more" is dated in its own way. It's a very early-20th century conception. And we cling to it at our own peril. Thanks - you make a very good point. Subjectively at least, I tend to agree with you! What is your basis for saying that Glanvill was a Puritan clergyman? Oops, sorry - I didn't research this carefully enough, did I? I saw "Reared in a strict Puritan household" on Wikipedia but missed where he "became an articulate defender of Latitudinarian Anglicanism". So I was wrong: he was an Anglican clergyman, not a Puritan one. Thanks for drawing my attention to this. Private Investigator is professional enough to help you investigate on a case. The Privatdetektiv is always done that problems. They are also lot of knowledge to done a every problem.